As it stands its been 6 hours since my first ever ride on the KTM train decided to conveniently breakdown in the middle of nowhere at the Bukit Anna station. 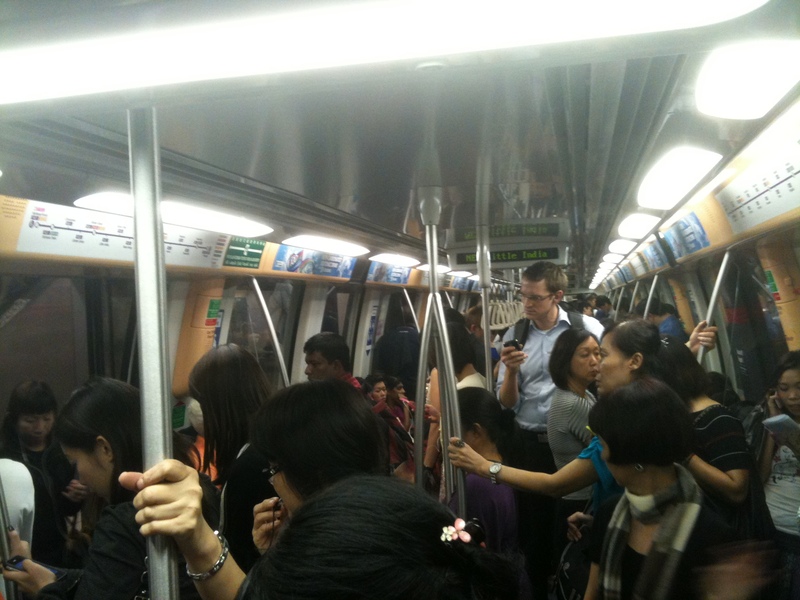 I guess I spoke too soon when I told myself how lucky I was not to be in an SMRT train over the weekend. 4.) The only show they are playing, Goblet of Fire without any audio has now been shown 6 times. 5.) The debate concerning the word ‘refund’ is non-existent. While SMRT has a woeful Corp Comms, KTM trumps it with its apparent No Comms department. Essentially no announcements are made, staff give you a meagre shrug of the shoulders and say ‘engine spoil’ when you ask them, and they seem to be having a ball bickering with each other. Strangely enough i kind of feel all right sitting in a little hut in the middle of nowhere with tens of others. People around me are indeed asking questions about the situation but none are doing it with the ferocity and maliciousness that the SMRT staff has been berated with. Everyone seems to be in a whole ‘well, that’s all they can do so let’s just wait it out’ kind of attitude. As I begin to wonder how this event would have played out back in Singapore, I begin to sense that the people here are in no real hurry, that they have somehow become contented and learnt to live with such situations in a country just miles across the Causeway. I’m sitting on the tracks waiting for the third engine to come (amazingly the second engine broke down as well, MALAYSIA BOLEH!). From my little perch I can see that Harry Potter is at the Quidditch World Cup, yes my friends Goblet of Fire is now into it’s 7th run on the train. I’ve also managed to listen to almost all of Radiohead’s albums to date and have a suddenly start to dream that i’m on the Hogwarts express sitting beside Emma Watson. The train is starting up and everyone’s just glad that we are going home. I’ve also gotten a bun to eat after 10 hours. When I came back after spending 17 hours on the train, I flipped through the papers and didn’t need to look far online to get a consensus of what was going on. It’s interesting to see how one situation can produce such a slew of parodies, human-interest stories and basic field day for the media. We have the hardliners blaming the Government and demanding the SMRT CEO gets sacked while overseas expats/Singaporeans seem to enjoy telling everyone that there are worse problems out there. I do agree with the latter to some extent, but as I continue to grow in Singapore I’m beginning to see that we are (sorry backdated slogan) Uniquely Singapore in the way we react to all the social-political changes in our society. I’ll have to admit that SMRT really outdid themselves with their template responses and vain attempt at corporate communications, and I wonder if I would have reacted differently if I were part of the crowd. Would I have broken the window in the train? Fume at having to walk in the tunnels what with my claustrophobia? I can safely say that there is a possibility I would, due in large part to being influenced by the hordes of pissed off people around me. Ultimately i think this scenario arises a result of our constant strive for perfection. We have and will continue to methodically single out every fault, every error by the Government, every mark in an exam, everytime a BTO comes up, everytime the COE goes down. Yes, questioning the Government is indeed good for the progression of society, but I do think that it’s becoming a case of always wanting what one can’t get and in the end we will be hard pressed to find a point where we become contented. Yes there are many factors to explore as to why we behave in this manner, be it our inability to protest openly unlike on Occupy Wall Street or the sheer nature of our largely one-party political rule since our independence. For me I see it hard to set myself in the middle of all this, between love and loathing. I definitely love aspects of Singapore and wish to have my own flat one day, but instances like these often get me wondering just how lost and discontented we have become and how it will turn out in the years to come.